White and Williams proudly sponsored The Philadelphia Orchestra Chinese New Year Concert, a special performance celebrating the Chinese New Year and Year of the Pig on Tuesday, January 29, 2019. The Philadelphia Orchestra performed side-by-side with long-time partner, the Shanghai Philharmonic Orchestra, in a special one-night-only performance. This collaboration also previewed the Philadelphia Orchestra’s May 2019 Tour of China in conjunction with the 40th anniversary of diplomatic relations between the U.S. and China. The concert featured "Peking Fantasy" by composer Peng Peng Gong, a work co-commissioned by POA and SPO. This work, a symphonic fantasy, is based on the tradition of Beijing Opera. Forty-one SPO musicians alongside 64 Philadelphia Orchestra musicians performed this new work along with additional western classical repertoire. The concert was a free, public event that created an opportunity for Chinese and Americans throughout Philadelphia to celebrate the Chinese New Year, as well as the anniversary of renewed U.S.-China relations, which initiated on January 1, 1979. 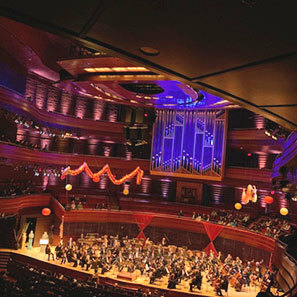 The concert represented a unique and important opportunity for the Orchestra to connect with Philadelphia’s large Chinese-American and Chinese Immigrant populations. White and Williams LLP is the official law partner of The Philadelphia Orchestra in China.